On Monday, by taking advantage of the opportunity that on Saturday we would build one of the gardens planned by me, and at the last minute I can add to the order a few plants I want to be taken to Budapest together with the rest, I checked some Heleniums over the web, and thus again I ran across the Battery Plant Database. On this occasion I decided that I would put out these few links on The Battery Gardens. 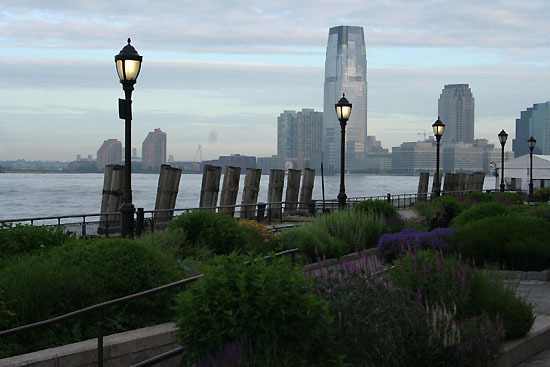 The Battery is the point of Mannhattan at the confluence of Hudson and East rivers where the first Dutch settlers landed. It got its name of the first artillery stationing here to defend the young city. 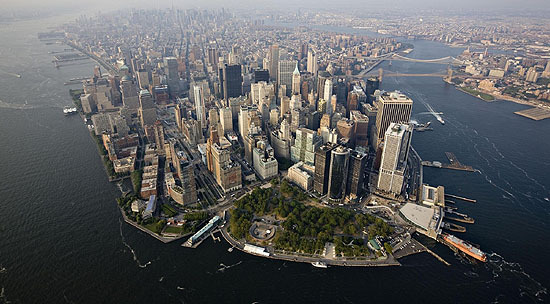 The castle built here was New York’s first cultural center and later the first reception center for immigrants, converted in the early 20th century into the first aquarium of the city. After the renovation of the castle in the 1970’s a cultural and tourist center was established here again, and in recent years the hitherto quite neglected garden has been renovated, too. The two gardens established here belong to the major jobs of the Dutch garden designer Piet Oudolf, a leading figure of the New Perennial movement. 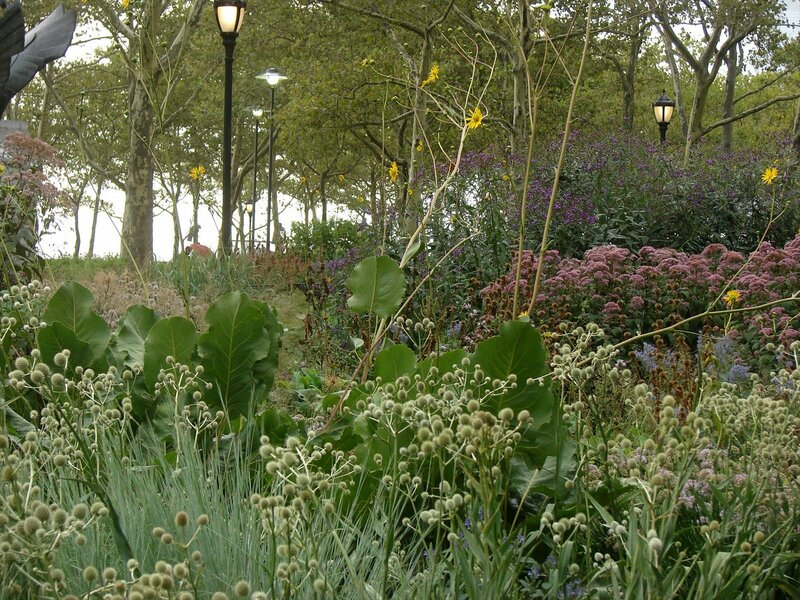 By entering the site of The Battery Conservancy and clicking on the Things to do above, the first option offered is the Gardens. By clicking on it, you can see a series of beautiful pictures on the park, you can check various information pages on Piet Oudolf, the details of the park and its plants, and if you think so, you can even buy plants from there. The New Perennial movement has never belonged to the mainstream trends of gardening. In the last hundred years the main currents of gardening mostly regarded plants as objects to be used for various purposes, an element of the architectural concept, which as a living organism was of very little interest to the designer. What is important to him/her is the optical unit, the effect to be achieved with the plant as a bloc, and the individual features of the plants are completely irrelevant as long as the desired effect is achieved through it. In modern gardens the plants often appear as an inarticulate green medium without any individual significance, whose only function is to provide a counterpoint to the concrete, metal or plastic objects placed in the given space. And when the plants are the main character in the garden, they usually create images with flowers, possibly of great size and strong colors. These images usually live only a few weeks, while in the rest of the year the gardeners dig out, distribute, cut down, force into artificial support system, tie and prune them, so that in those few weeks when in the given bed everything is blossoming and the image is ready, the plants would display the desired size and form, which is often very different from their natural size and form. As these beds are attractive only for a short period, the gardeners often start the plants in the nurseries, they bed them out in full blossom, and after blossoming they take them out and throw them away – not only the yearlings, but also the perennials –, and plant a new set. In these perennial beds the gardeners usually adopt vivid colors, which act as a strong stimulus, and overshadow any other element. 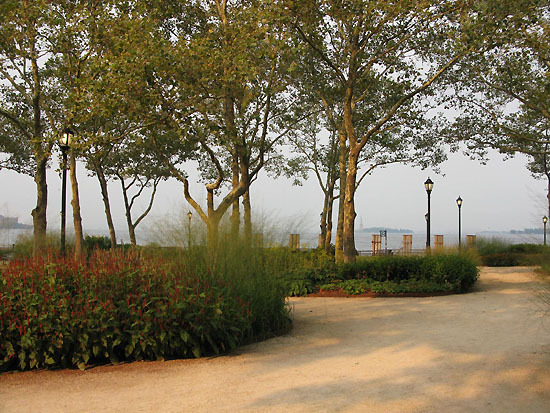 The New Perennial movement, on the wake of Foerster, unfolded this relationship to plants. Here, the gardeners do not want to demonstrate the enforcement of their will, and they do not intend to maximize the sensory stimulus, but they are passionately interested in plants. The gardener knows exactly the environmental needs and tolerances of plants, so he is able to establish in any environment ensembles which develop well and require little maintenance. The thoughtful understanding of the growing, flower and leave forms and colors of the plants, and the humility with which the gardener do not want to put himself at the center, but wants to unfold the inherent beauty of the plants, opens a very large space to creativity. The fact that today the German gardens, for example, use perennials so widely and with such a high quality, is a good indication of what a huge job has been realized in this field by the gardeners. However, the world fame was brought to the movement by the work of Piet Oudolf. Oudolf added to the results accumulated over the decades not only the extremely sophisticated visual culture of Flemish painting, but also his extraordinary talent. The result is a series of gardens where every plant is on the place best fitting to it, which show the beauty of the plant from sprouting to withering, which give a natural impression as a result of professional color management and richness of form, and nevertheless they are in fact an incredibly sophisticated combination of plants. Which touch your heart without being sentimental for a moment, and open you up to freedom without having any moment of destruction. While the ideologists of the leading horticultural trends aestheticize and raise into high culture the destruction labeled as modern or postmodern art, and while mass culture is flooded with the magazines and coffee table books showing almost only three weeks old beds (and even this is not enough, because they sharpen and saturate these pictures so that the reader gets the maximum stimulation and does not fall out of the wheel of consumption), there are people who do not let themselves being swept with the mainstream. 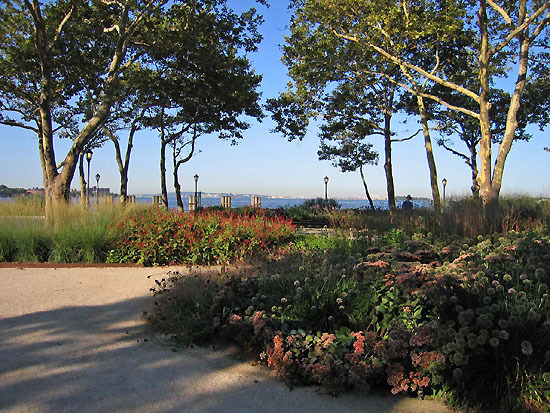 I find it beautiful that in the Battery, where 8.5 millions of immigrants – who mostly had to leave their country because of politically legitimized hatred or poverty – were received by America, now there are two New Perennial gardens. 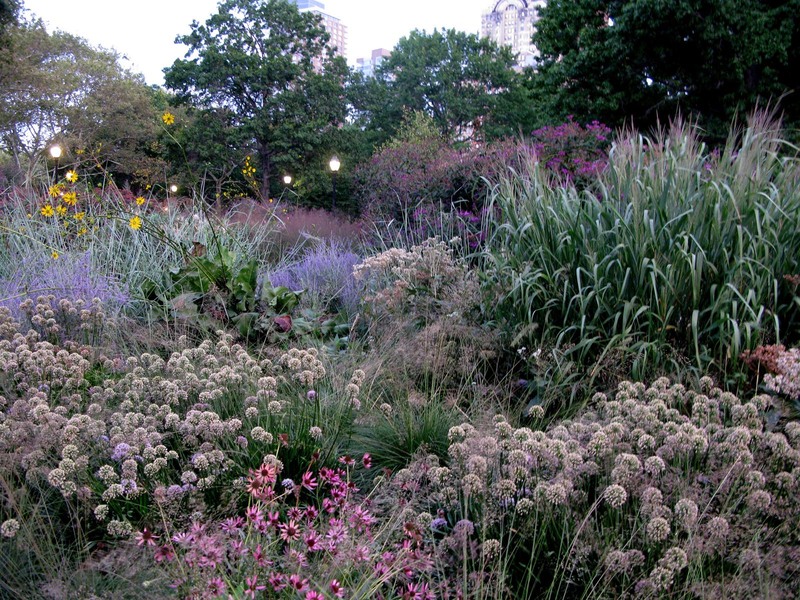 If you are interested, check the pictures loaded on Piet Oudolf’s site, on The Battery page, too. (And once you are there, have a look at the other gardens of Oudolf as well.) 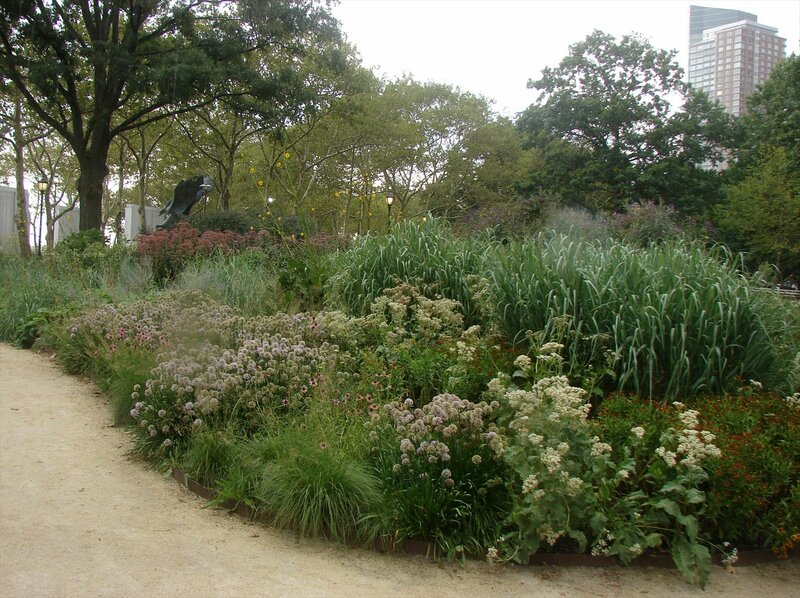 If you are fascinated by this work of Piet Oudolf, be sure to read the excellent articles on the Battery in the great blog of James Golden. And if you have even more time, then – back to the stove – absolutely dig a bit into The Battery Plant Database, either in order to have a look into the workshop of the New Perennial, or just to marvel at these beautiful plants.